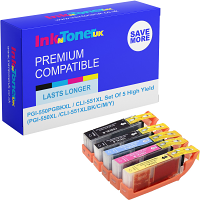 Black Friday sale now on at InknTonerUK! At InknTonerUK we have a fantastic range of deals and offers to save you money on this Black Friday weekend. Firstly, we have a code for 10% off of any non-original products. That includes all compatible inks and toner cartridges, all you need to do is put in the code: DISC1117 on your next purchase to redeem this offer. As well as that we have free delivery, we also have a price promise guarantee that means you pay a price that can’t be beaten. If you have already bought products from us and then bought the same product elsewhere at a cheaper price elsewhere, we can action a price match promise by refunding the difference so you are always guaranteed to pay the lowest price. If you want to claim that follow these steps. We also have reward points that can be redeemed when we give you a discount code that can be seen on our website at www.inkntoneruk.co.uk. Or, on our social media platforms, like twitter and google+. Good luck with your Black Friday and Cyber Monday endeavors.